Cleaning your AR-type rifle is a great opportunity to run through a quick checklist of preventative maintenance and inspection steps. Investing a few seconds in some quick checks may just help your rifle from vomiting parts while at the range, which can ruin your fun range day and embarrass you in front of your friends. One thing to check at every cleaning is the extractor. If you kick in doors for a living, you (hopefully) already have a personal routine for rifle maintenance – it’s life and death after all. But if you’re a recreational or competitive shooter, then you can afford to be slightly less rigorous. Contrary to internet myth, the AR platform has become a pretty darn reliable piece of equipment. Back to the point. I jotted down this list of things I like to check out when I have my rifle field stripped for basic cleaning. Take a look, but don’t get all stressed out about every little detail. Your AR-type rifle is a remarkably resilient platform. We’ll use a Smith & Wesson M&P15 OR (Optics Ready) as a model for this exercise. It’s a common gun that’s solid and reliable, with standard parts. You can check the very first item as you separate the upper and lower halves of your rifle. If everything is fit properly, you should be able to push the takedown pins through with hand pressure or very light tap. If you have to break out a hammer to move your takedown pins, something is wrong – the whole point of the AR design is to be able to use a finger, bullet tip or field-expedient tool to field strip the rifle for basic maintenance. Besides, hammering away on your (most likely) aluminum receiver is usually detrimental to the long-term health of your gun. The takedown pins should not require excessive force to open. By the way, the safety lever shown here is a Blackhawk! Offset Safety – one of the neatest little AR inventions ever. While we’re still on the outside, give your muzzle device (brake, flash hider or silencer) a firm twist in both directions. Is it solid? While rare for a factory mounted device to work loose, it happens. If you’ve ever removed the factory device an put your own in place, it’s somewhat more likely. A half-second check, every cleaning, can prevent a whole lot of embarrassment and worse yet, flying chunks of metal. Another no brainer is your optic and mount. Check the bases to make sure they’re still tightly affixed to the receiver. Check the scope rings, if applicable to make sure they’re tight to the proper specification. Poor accuracy from a rifle is almost always the result of something silly like a bad scope or loose mounts. Sometimes its optic internals and you can narrow that down by ensuring that the externals are solid. One benefit of investing in a high-end optic like this Aimpoint PRO is that it will stay put. I love this self-torquing mount. Just give it a quick turn once in a while ’til it clicks, and you know it’s tight. When you open the upper receiver, the first thing you do is remove the charging handle and bolt carrier group. 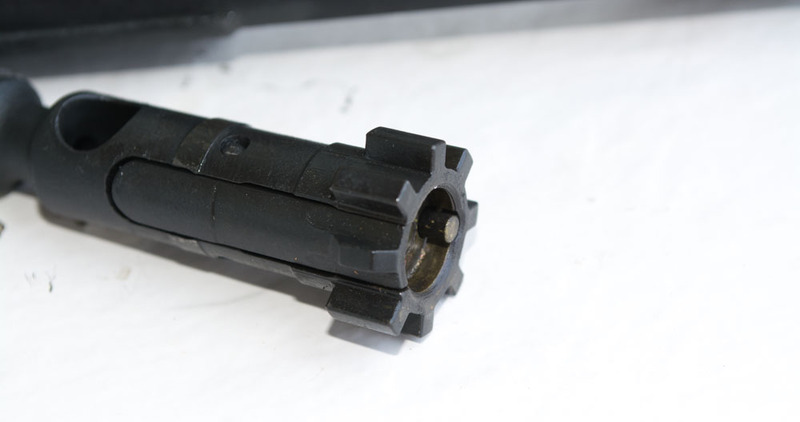 Since you’ve got your hand on it anyway, this is a great time to do a quick visual and tactile inspection of your bolt carrier gas key. Look at it to make sure the screws are firmly in place. More importantly, give it a firm twist with your hands. It should be rock solid on the carrier body itself. If it’s not, you’re going to have some malfunctions headed your way as gas is bleeding off before doing it’s thing. The repair procedure is too involved to cover here, just know you’re going to want to take it completely apart, thoroughly clean and degrease everything and firmly remount it and stake the screws in place. This gas key is rock solid. The screws are properly staked. I also checked for cracks on the carrier body. As you disassemble the bolt from the carrier, check the carrier body itself for cracks. Pay close attention to high-impact areas like the cam pin hole – that takes a beating over time. If you see any cracks in your carrier, it needs to be replaced. No big worries though, for a recreational rifle, this is somewhat unlikely unless your bolt carrier group is made out of Mighty Putty . This is also a good time to inspect the lugs on your bolt. Make sure there are no chips or peening signs. Peening is just a fancy word for “smashed” or “dented.” If you see signs of either, it’s time for a new bolt. These bolt lugs are sharp – just the way they should be. When you wipe down the firing pin, put on your Mr. Magoo specs and look at the tip. It should be smooth and rounded – no chips or weird dents. Again, if you see either, get a new one. They’re cheap. Slightly dirty, but this firing pin is in perfect condition. I like to pop off the extractor and take a quick look since that’s one of the more likely failure points. Check the extractor to make sure it’s whole and has nice sharp edges. Also take a look at the spring and booster. That’s a plastic insert inside the spring. Again, these are all cheap parts, so if anything is missing or looks wonky, replace it. People get all lathered up about gas rings . If they’re not perfectly “unaligned,” meaning none of the gaps line up, then the moon might crash into Possum Kingdom, South Carolina. And that would be tragic indeed. In reality, If you have more than one gas ring in place, your rifle will most likely still function – gaps aligned or unaligned. If memory serves, AR guru Patrick Sweeney did some tests way back when to test this and found that it just doesn’t matter all that much. Once again, if you’re employed as one of those dudes or dudettes that line up outside Meth labs or clay huts, then you might pay more attention. As to the rest of us? Check them and tweak their orientation, but don’t lose a lot of sleep over the issue. Oh no! These three gas rings are ‘almost’ lined up! Run for your lives!!! In an ideal world, what you should see is three normal looking gas rings, with the gaps unaligned. To test for wear, simply pull the bolt out of the carrier as far as it will go. Stand the bolt and carrier up on a flat surface. If the carrier doesn’t start to slip down, you’re good to go. If it does, your gas rings are worn. Get some new ones. 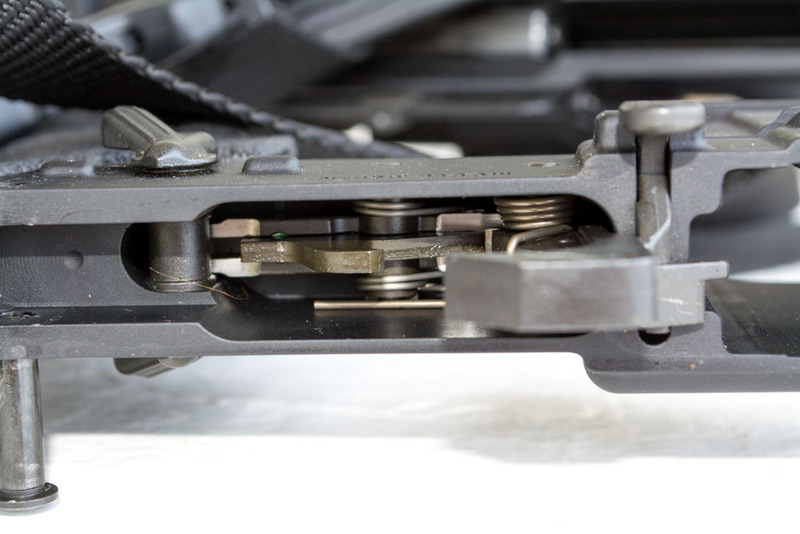 Moving to the lower receiver, take a peek down into the trigger assembly area. You’ll almost certainly see grime and crud, and that’s OK – you’re about to clean it after all. What you don’t want to see are primers or pieces of primers. 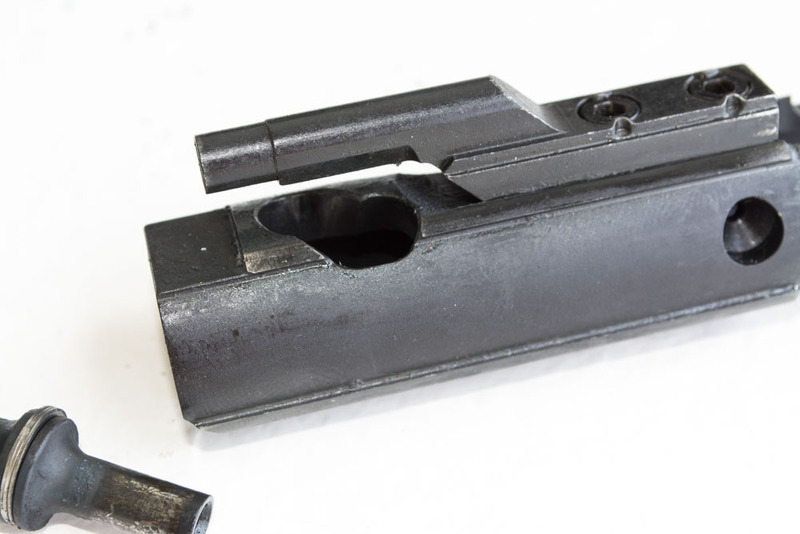 If primers are getting blown out of cartridges once in a while, that could be indicating pressure problems with your ammunition, overheating or possibly headspace problems. Wow. Pretty clean for one of my rifles, so I had to show this photo. Most importantly, there are no primers or bits thereof in here. Remove the buffer and spring. Check for gunk in the buffer tube and wipe it out as necessary. While you have the parts out, check the buffer itself to make sure it’s smooth and not messed up. Give that spring a wipe too. If you’re a casual or recreational shooter, you can lube up the spring to quiet some of that “sproing” noise during recoil. Sproing is another fancy word, but fortunately it does not cause harmful things like peening – it just sounds uncool. You might as well pop the bottom off your magazines and give the interiors a quick inspection and wipe down. If you’re dropping them in the dirt, they will get crud in them. One of the biggest causes of malfunctions is dirty and / or damaged magazines and it’s easy to be proactive about that. If I’m having reliability issues, the magazines are the first thing I’m going to check. Last on the list, after you reassemble the upper and lower receivers, take a good look at your rifle as a whole. Is it still awesome? Does it still look ridiculously handy and fun to shoot? Yes? Then you’re good to go! How about you? How rigorous are you with preventative maintenance? What are the things you look for?